It's so easy to wax poetic about the autumn season: the colors of the leaves, the cool mornings, the appearance of handknit woolies for the little ones, and the abundance of stunning produce at the open air markets. It's a gorgeous season to revel in and every time it rolls around I am happy to be in Quebec. My early childhood years were spent in the Yukon where fall was nonexistent. One day it would be summer, with green hills and bright yellow zucchini flowers blooming in the kitchen garden, and the next day I would wake up to frosted window panes. If I scratched a peek hole with my fingernail, I would see a motionless Lake Laberge, completely iced over, a brown frost-killed garden and the breath from the goats hanging in the cold air as they chewed their cud. Winter. It always struck without warning and when it arrived, it stayed for almost nine months. Fortunately, as an energetic nature-loving little girl, I embraced winter for all that it offered: sledding parties with hot cocoa on the wood stove, ice skating for miles and miles, snow ice cream, igloos and cross-country skiing. But why am I talking about winter? I'm shivering just thinking about it! Where was I? Oh yes, Autumn in Quebec. This time of the year always makes me want to hole up in the kitchen for days on end with the finest ingredients of the season and create copious amounts of food. Pies stuffed full of apples, velvety squash soups, slowly braised meats with herbs, beans baked in apple cider, and the list goes on. If I have my way, October is going to be a very busy month Under the High Chair. For now, though, I am working on preserving some of summer's last produce before moving on to the fall goods. This spiced yellow plum jam turned out so well, it left me asking myself why on earth I had never made plum jam before?! It's tart taste and gorgeous sunny color is a joy to wake up to in the morning. The spices add a subtle complexity that you might not catch until after your first cup of coffee. Best enjoyed on fresh scones. OK, so this is the "Aimee's Speedy, Somewhat Controversial, But Tried and True Version" of the jam. For the original, no shortcuts version, go here. You may be surprised to know that most people I talk to sterilize their jars in their dishwasher and find that as long as you are ladling HOT fruit into HOT jars and topping with a HOT lid (and never touch the inside of the jar) the jams seal themselves and there is no need to process in hot water afterward. This is now my method for jam and I haven't had any problems. Of course with the amount of sugar in the jam and the speed at which they get consumed around here, there's no chance of them ever going bad! What's your canning method? Any thoughts? Prepare your canning station by collecting all your tools: a pair of tongs, a 1-cup glass measuring cup, a wide-mouth jar funnel, a spatula and a few clean dish towels, one of those awesome wands with a magnet on the end for lifting the lids out of the hot water. Place 8-250 ml in an empty dishwasher (this is not the time to clean breakfast dishes as well)and run a cycle. When jars are on the dry cycle, start your jam. Place your sealing discs ( the lids) in a small pot and cover with hot water. Keep very hot, but do not boil. Place jar rings within easy reach. Half, pit and roughly chop plums. Tie spices together in a square of cheesecloth for a spice bag. In a large, deep stainless steel saucepan, combine prepared plums, apple juice and spice bag. Over medium heat, bring mixture to a boil, stirring frequently. Partially cover, reduce heat and boil gently, stirring occasionally, for 5 minutes. Remove from heat and set spice bag aside to be added in later. In a clean stainless steel saucepan, combine 4-1/2 cups (1.125 L) of the cooked mixture, spice bag, 1/2 tsp (2 ml) butter or margarine (to reduce foaming) and all of the sugar. Over high heat, stirring constantly, bring to a full rolling boil that cannot be stirred down. Stir in the liquid pectin. Boil hard, stirring constantly, for 1 minute. Remove from heat, skim off foam and discard spice bag. Using a tea towel to protect your fingers from the heat, take a hot jar from the dishwasher and place on your counter. Ladle hot jam into a hot jar to within 1/4 inch of top of jar (head space). Using nonmetallic utensil, remove air bubbles and adjust head space, if required, by adding more jam. Wipe jar rim removing any food residue. Center hot sealing disc on clean jar rim. Screw band down until resistance is met, then increase to fingertip tight. Spread out a tea towel on your counter and place the jar of jam on it. Repeat canning process with remaining seven jars. Leave jars to cool 24 hours with out touching them. After 24 hours is up, check that all jars have sealed. If any have not, store them in the fridge and use first. Store the rest in a cool, dark place. Not long ago I celebrated two years of blogging at Under the High Chair and I gave away a lovely little gourmet spice kit--or at least I tried to. What's that? You say. You mean that kit isn't on its way to the lucky winner? Nope, it's still on my kitchen counter. It is rather difficult to ship it out when you have no idea where it is going! The winner, a girl named Jill, has yet to claim her prize and I must confess, I am really tempted to pick another name. I have conferred with some respected members of the food blogging community and no one knows the protocol for an unclaimed prize. In fact a few of them tried to convince me to give the present to them! Hmm. I will randomly pick, not one, but seven names from the original giveaway post and post them all here. The FIRST person to get back to me with their complete mailing address wins the spice kit. The thinking behind that plan is to avoid another 'Jill' scenario (sorry, Jill!) and have the spices go stale for another two weeks while I wait for the new winner to contact me. So, look for seven names to be posted here on Sunday. Good luck everyone! So, it's about an hour before guests are to arrive and the birthday boy, Noah, is out on the deck helping his dad decorate for the party. 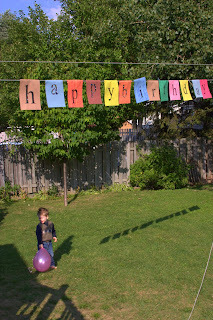 There's a banner that said "Happy Birthday" on the clothes line, a colorful homemade pinata stuffed full of candy dangling above the grass, and a row of be-jeweled handcrafted party hats lined up awaiting the little guests. All of a sudden, Noah, who has observed almost all the preparation and can hardly contain his anticipation, stops and looks up at me with a worried look on his face. "Mummy!" He says anxiously. "We need CAKE!" We had a lovely party, despite it being rather hectic, and there was everything a good party should have, even if you're just three years old: good friends, good food, good weather (!) and plenty of laughs. After stuffing ourselves with tacos, soft wraps and tostadas with plenty of salsa cruda, the children took turns trying to bust open the pinata. Apparently I construct a solid pinata, because, despite the best efforts of two little boys with big sticks, it required the arms of an uncle to spill its guts. I don't think that is a sight Noah will soon forget: raining candy. For someone who is seldom allowed sweets, it was amazing to be allowed to fill his pockets and mouth right then and there. He's been taking about it every day since and has suggested a few time that we make 'another pinata'. "Mummy, I need a FORK!" To which I informed him that there were certain rituals such as singing 'Happy Birthday' to be performed first. So as soon as the song was sung and the candles blown out, he repeated his request, equally as loud. The urgency of this child! There's no question, by the third birthday, they know what it's all about. 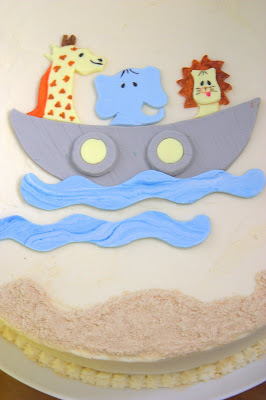 I figured this was probably the last birthday that I could get away with decorating the cake however I wanted, as next year there could very well be a request for a 'Cars' cake or some pre-historic creature cake that I will have to attempt. I had known for a while how I wanted to decorate this cake since my son's name is Noah...and well, you can probably figure the rest out! The design is made out of rolled fondant, colored with food colouring paste, cut out with an x-acto knife and painted with more food coloring. The eyes are black sesame seeds and the 'sand' is maple sugar. This part was so much fun to do! Noah had requested 'chocolate-chip cake' at some point prior to the big day which made me decide to go with a Banana Chocolate-Chip cake. The maple frosting was merely inspired by a late-night rummage in the pantry where I happened upon some specialty maple products such as sugar, spread and syrup and thought hmm..., maple would be great with the banana. Turns out it was OK! And Noah loved it. I think we'll be converting this recipe into cupcakes very soon. A little off the food topic (although they did require cooking) are these homemade take-home gifts that I made for the guests. I didn't want to give out another plastic toy that was doomed to just break and end up in a landfill somewhere, but wanted a 'greener' gift. My recipe for play dough came in handy here as I made several batches and colored them into pretty colors. I packaged the balls in Tupperware, something that can be reused long after the play dough is finished, and attached a little plastic cookie cutter for making shapes with the dough. Here are the recipes, free of charge as usual! -Gather the necessary ingredients and mix the dry ingredients together. -Mix all of the ingredients in a large pan and heat it over medium heat. -Stir constantly until the dough feels like stiff, smooth, mashed potatoes. At this point, take it off the stove. Once it has cooled enough, knead it until it is blended smoothly. -Divide the dough into several balls. Add food colouring to each ball and knead until colour is blended in. This works best if the dough is still warm. -Store the dough in an airtight container or bag. -Preheat oven to 350F. Grease and flour two 9-inch layer cake pans. -Cream butter and sugar together. Add egg yolks and beat well. Add mashed bananas, mixing thoroughly. -Sift dry ingredients and add to butter mixture. Stir until just combined in. Add buttermilk and vanilla. Beat egg whites to soft peaks. Fold into batter gently. Sprinkle in chocolate chips and fold together. -Pour batter into the prepared pans. Set on the middle rack of the oven and bake for 25 to 30 minutes or until a cake tester inserted into the center comes out clean. -Cool in pans on a rack for 10 minutes. Unmold and cool on rack for 2 hours. -When cooled, place one layer on a serving plate and frost with Rich Maple Frosting. Cover with second layer and cover cake with remaining frosting. -Cream the butter and the cream cheese together in an electric mixer. Add the brown sugar, vanilla and maple syrup and beat for about a minute, scraping down the sides of the bowl. Be sure mixture is smooth, ingredients are well incorporated and there are no syrup streaks in the icing. Add 2 cups icing sugar and mix slowly. Add the cream and mix until smooth. Add remaining 2 cups icing sugar and mix well. -Frosting will be quite thin. Just a quick post today as we are all a-flutter getting ready for Noah's third birthday! There is still a homemade pinata to paint, balloons to blow up, a dozen lemons to squeeze for his favorite drink (lemonade) and most importantly, a cake to decorate. I'm sure I'll be up far into the night icing it-I don't want to start it until he is fast asleep!! At some point amidst all the busyness, I'm sure I will be shedding a tear or two over the fact that my baby, my firstborn, is growing up. Sniff! "A-R-R-E-T. That spells 'Stop'." and I had to laugh. Only in Quebec can things be this confusing for a child. OK, so I don't have a recipe for this, as I literally just melted some butter, added a sprinkling of brown sugar and the peach halves to the pan. I then dusted the peaches in cinnamon and topped the whole thing with a round of chilled puff pastry. Into the oven it went until the pastry was golden brown. If you've made an apple tart tatin, you can make this! If not, you might want leave this useless post and check out a real recipe for tart tatin. First of all, let's not waste any time in announcing the winner of the spice kit from Under the High Chair's second birthday dinner. Rest assured that the selection of the winner was done in a most thorough way, overseen by my husband, the engineer in the family. Jill, please contact me via email with your address and information and I'll get your present out to you as fast as I can! A big thanks to all who participated and left such great comments! This was the first giveaway I've done, but it certainly won't be the last--it was so much fun to see people popping in from the four corners of the globe...and two hundred comments is such a nice round number for the draw. My self-appointed mission was as follows: bake cupcakes for two-week-old Amber's baby shower and make them as pink and girly as possible, because with three men in the house, we never get to play with glitter, sprinkles and pink food coloring, let alone even make cupcakes. This is the first time homemade cupcakes have been featured on UtHC. That's right, we just celebrated two years of posts and all this time you have been deprived of cupcakes. Everywhere else, cupcakes are flaunting themselves, blogs are devoted to them, boutiques specialize in them and celebrities crave them. I mean, it's practically the decade of the cupcake and although I've kept you up to date with the best cupcakes in the city, I haven't been baking any myself. Anyway, enough with the introspection, I've finally made some cupcakes and although they came out rather garish (I might even say ghastly), I had a heck of a lot of fun playing on my Pretty in Pink theme. "So what flavor would you say these were anyway?" Hmm, good question. Vanilla? Buttermilk? Is pink a flavor? For the cupcake itself, I adapted a recipe for Buttermilk Red Velvet from Joy the Baker, using less red food coloring and doubling the amount of vanilla; it was fluffy and moist, not to mention hot pink!! I frosted the cupcakes with Brown Sugar Cream Cheese Frosting which Joy frequently pairs with Red Velvet Cake and I am in full support of that marriage. Yum! Edible glitter and sprinkles adorn the frosting and finally, the cupcakes are topped with cut-out hearts of rolled fondant. The baby's name is hand painted onto the hearts with food coloring. Voila. Long after these cupcakes were consumed at the baby shower and the leftover frosting eaten with a spoon, I happened upon foodbeam's Sugar High Friday event: Cupcakes, the final chapter. It crossed my mind to submit these cupcakes, but then told myself, naw, who am I kidding? It's Fanny, for pete's sake! I didn't even get to do an official photo shoot for the cupcakes, what you see was snapped at the shower while I ignored Mateo's complaining from his car seat in the corner. (Bad mother) There was no way I could send my insanely pink baby girl cupcakes in response to her call for "delicious cupcakes, baked with flair, sophistication and novelty'. But then I kept reading Fanny's post and somewhere in it she said 'most importantly, have fun', and that's precisely what I did with these cupcakes. I mean, edible sprinkles and light pink fondant? I had a blast. 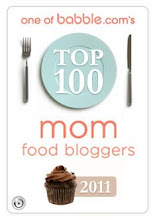 So be sure to check out foodbeam.com at the end of the month for the round-up of cupcakes, and please, go easy on my entry, okay? Here are the recipes if you are interested in making your own really pink cupcakes. 2. Cream the butter and the sugar using an electric mixer, until the mixture is pale and fluffy. Add the eggs one at a time, letting the eggs beat for 1 mintue in between additions. Scrape down the bowl in between additions. Add vanilla and beat well. Things are not looking so good in the vegetable patch, people; it’s downright ugly out there. Don't be fooled by these photos, someone has taken my cute little kitchen garden and replaced it with a mucky, rotting mess of weeds. The rain did Not. Let. UP. in August and the water just pooled in my clay soil, rotting the garlic and tomato plants. Fortunately the tomatoes still ripened like crazy, giving us plenty of filling for our daily toasted tomato sandwiches for our weekday lunches, but they are mostly finished now. 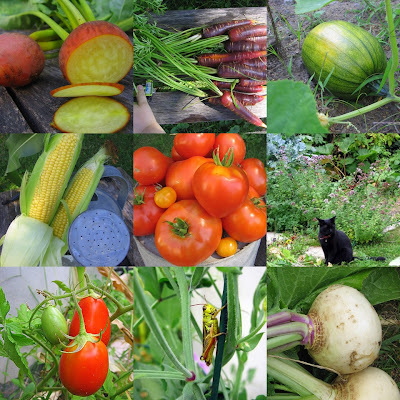 As you can see, we have been harvesting something other than tons of weeds, but nothing in mass amounts. Carrots are sweet and prolific enough. Noah has learned to harvest his own and wash them off in the bucket of rainwater for an outdoor snack. Watching him munch on them is reward enough for all the work that a garden requires. For all the people who told me I couldn't grow corn: it was amazingly sweet and did very well. I'll double my planting next year, since I found myself sharing the crop 50/50 with the squirrels. Ever watch a fat squirrel try to negotiate along a skinny fence with a half-gnawed corn cob in it mouth? Hilarious. The pumpkins are more than just fraternizing with the potato patch, they have moved in and redecorated. If I had known two plants would spread around a ten-foot radius, I might have reconsidered, but the pumpkins are starting to take on a cheery orange color and look just too pretty peeking out from the foliage for me to overly complain. It hasn't been hot enough for the peppers, each of my three plants have been working on producing one pepper each all summer long and with that kind of productivity, it's going to be straight to the compost for them; do not pass the kitchen, do not collect two hundred dollars. Yellow beets are taking their time, but sure look pretty. A big thanks to everyone who has responded so far to my spice kit giveaway and sent happy birthday wishes this way. I'm touched by all your kind words, encouragement, and support. PS: If you haven't left a comment in the post below yet, you still have until Saturday to do so and your name will be entered in the draw! 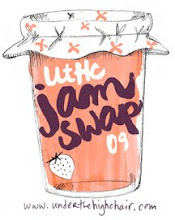 Happy Birthday to UtHC and a Giveaway Present for You! Today is our second birthday here at Under the High Chair and I am celebrating by giving you a present! Find out at the end of the post how you can win this world-class spice kit for your own cooking pleasure! Today we are celebrating two years of blogging! Hip hip hooray! Go ahead, give us a pat on the back. I'm so excited about this post! Don't go anywhere! I was thinking last night about how I wanted to sum up this past year of blogging. I was imagining how I would go on and on about how busy the year was, how I wasn't sure how we would get over the hump (sorry, bad pun) of having a baby and how that would affect my blogging time, but shucks, who wants to read about all that?The bottom line is: I'm still here and more importantly, so are you! I want to say a big 'thank you' to my readers, both those of you who have been with me since day one and the new arrivals; you guys are the best! There are two things I would like to do for you to show my appreciation, one is a virtual dinner party that you are all invited to (also to showcase a few dishes from this past year) and second, a fantastic giveaway that I intend to ship anywhere in the world (or deliver in person if the lucky winner is local)!! So, hurry, cancel whatever you were doing tonight, and get over here! I've said before, picking a favorite dish or post on Under the High Chair is like being asked who I love more, Noah or Mateo: completely impossible to answer. So don't consider these dishes to be my final word on my ultimate best dish, but more like recipes I can't get enough of, my fall-back dishes for entertaining and food that is just so good you forget all your troubles. So come on in and kick your shoes off! I would love to wake up your palate with my most seductive amuse bouche, Foie Gras Sushi with Pears and Ice Cider Reduction. Enjoy it while you are curled up on the sofa or perched on my piano bench; it's a perfect way to start the evening. A glass of chilled ice cider goes with it and a few napkins; it's pretty messy and meant to be eaten in two big bites. No nibbling here! It's important to get all the components - nori, rice, wasabi, pear, seared foie gras and ice cider reduction - in your mouth at the same time. Cheers! Leave your glass at the sink and please take a place at the table! If you found the sushi very rich, you were absolutely right, but now here is a crisp, fresh appetizer with enough acidity to make your taste buds pucker: Winter Salad of Russet Apple, Pomegranate and Toasted Pecans with a Picked Shallot and Apple Cider Vinaigrette. Here's a reminder that fall is just around the corner! Russet apples happen to be my favorite, but any kind of apple would be lovely in this salad. Cipollini onions are also great instead of shallots, thinly sliced into pretty half moon wedges. Excuse me for a moment, while I take this focaccia out of the oven. It's best served piping hot, and so easy to make, I whipped it up during the boys' nap time so we could enjoy it with our pasta. Yeah, there's a story to go along with it about how I got started in professional cooking over ten years ago. What? You can't believe I had time to make bread? For you, anything! As a rule I don't usually make pasta for guests--it's so weekday dinner, but, mama mia, this recipe for Seafood Creole Tagliatelle is unlike any pasta you have ever tasted. I should have been grilling all summer long, but instead I found myself, night after night, grinding spices, peeling shrimp and stirring together this decadent dish. Many guests partook of it at my table, and although I tried every time to make extra so we could have leftovers, there was never one noodle left. Even my not-so-adventurous father-in-law (love ya, B!) had third helpings and when offered my famous Caesar salad, said "No thanks, I'm just going to eat pasta until I explode." Well, I hope you still have some room left. Let me just warm up my espresso machine. Since this is a virtual dinner party anyway, we'll pretend I have that $6000 Jura X9 I was drooling over the other day at my fave kitchen store. Espresso or chai latte? The latter would go better with our dessert. I love pairing spices with chocolate, and this decadent Chocolate Chai Cheesecake is a perfect example. Not a very glamorous dessert (cheesecakes always seem kind of stodgy to me) but you'll be won over with the first bite. You can undo the button on your jeans if you have to, I won't tell anyone; I know, I'm stuffed too! Don't worry about the dishes, I never let my guests do them. Shoo. Thanks for joining me for this birthday dinner! Cheers! I wanted to do this for my birthday, but for one reason or another, it didn't happen; fortunately this is the perfect opportunity to make your day and introduce you to some products from my friend, Philippe de Vienne. I've talked about him enough around here so he really doesn't need an introduction. Longtime staples in my kitchen-- and in professional gourmet kitchens around town--this spice kit will leave you begging for more! This little package contains staples like cumin and cardamom, but also includes some more exotic spices such as long pepper, which is a stunning addition to this Milk Chocolate Pudding-- but there I go again with my chocolate and spice fad. To win this "Kitchen 101-Base Spices" starter kit all you have to do is leave a comment between today, Saturday, September 6 and Saturday, September 13. I will do a random draw of your names and notify the winner here on Sunday. As I said before, I'll ship anywhere in the world, and if the lucky winner is local, I will deliver it in person if you wish. Please no anonymous comments, that's so boring. Good luck! Ed Note: If you missed the first year of Under the High Chair, this post sums it up for you in a nutshell. There's even a fancy-shmancy slide show for your viewing pleasure! Ah, the last long weekend in summer is over and school days are here again - well not for me; it's just the rest of you who have to get into a routine! 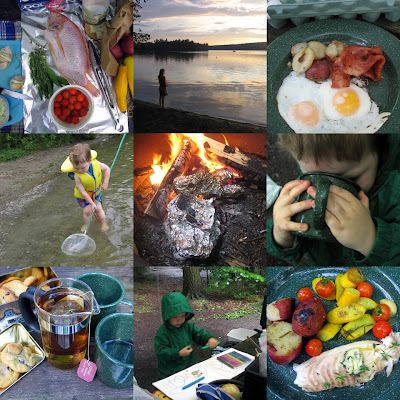 August flew by for us, but it was bookended by two memorable trips into the country, the first one being a fantastic camping trip that inspired this post. We were hesitant at first to try tenting with the little ones, but decided not to let that stop us and were rewarded with a memorable family experience that we hope to keep up every summer here on out. It wasn't just the food that was good (arguably the best part of camping, right?) but we had sunshine for at least half the time, successful mid-day naps in the tent, and no bugs to speak of! I just have to say, everyone has a different interpretation of what camping is. For some it is merely hooking up an RV in a camp off of some major highway, sending the kids to the pool and watching TV with a 24 of beer close by. For others it may involve packing only the bare essentials in a backpack, hiking deep into the wilderness and sleeping under the stars. Then there is the middle ground: backing your vehicle into a campsite in a provincial park, setting up a tent and using a combination of camp stove and fire pit for your cooking. This version seemed to suit us just fine when we joined a group of friends for a two-night camp-out on a small lake south of here. No one can say one type of camping is better than the other. It's all about what suits your lifestyle, your physical aptitude, wilderness skills and how you grew up camping (or not) with your parents. The same goes for camping food! While these ten items are camping 'must-haves' for me, there are plenty of people who are going to read this and say " Bannock? Huh? Where's the Kraft Dinner? The hamburgers?". Since my kind of camping when I was growing up was mostly of the wilderness sort, my camping menu items tend to reflect that influence. Classic breakfast camping fare. I mix my dry goods in a Ziplock bag at home, then add a little warm water to the bag at the campsite, mix in the bag and pat the dough into a cast iron pan. Biscuit like in texture, the bannock takes on the smoky flavor of the fire and is a nourishing start to the day! Batter can also be prepared a little thicker, rolled by hand into a rope, wrapped around a green stick and roasted like a hot dog over an open fire. This takes a lot of time and patience, as you need to cook it over low coals so it cooks evenly and the outside doesn't char. Only recommended when you have a lazy morning to kill, otherwise the cast iron pan works well. When we go hiking we are never with out a good trail mix and these delicious Clif Bars. With flavors like Cool Mint Chocolate, Banana Nut Bread and Peanut Toffee Buzz, these organic baked energy bars are the perfect pick-me-up whether you are bushwacking through the forest or smoking the opposite team in beach volleyball! We weren't camping long enough to warrant purchasing instant soup for this trip, but we all have our favorite dried soup mix or cup-o-soup. Invaluable on a cold, drizzly day, it doesn't get much simpler than just adding hot water. And don't get stuck in a chicken noodle rut, there are some great flavors out there like Spicy Black Bean. Do not leave home without plenty of instant hot drinks, no matter how warm you think the weather will be! The temperature drops dramatically at night and sleeping so near the ground can be quite chilly. I brought this organic hot cocoa (from Marchés Tau), a dozen tea bags and lots of ground coffee, thinking I was 'over packing', but we drank everything. Of course, once word got out that we were making French press coffee over at our campsite, we had to share a little. The classic s'more is made with a toasted marshmallow and a piece of chocolate sandwiched between two graham crackers. I always found that was too much cracker and not enough of the good stuff, plus I like my chocolate warmed to the sticky stage, so I changed things up a bit to create this masterpiece. The cookie is a Belgian waffle cookie (purchased) and it is big enough to hold two marshmallows, i.e. twice the goodness! The 'mallows are toasted until golden, then gently pulled off the stick, leaving the insides behind. A square of chocolate is inserted into each of the hollow, molten marshmallows and both are placed on the waffle and topped with another waffle. (of course you can do one at a time, too, but this is pretty economical). I like to set the whole the whole thing down near the campfire's heat until the chocolate melts enough. Mmm. SO good. I'm sure for some people, this is the best part about camping! Go ahead, make your Kraft Dinner, I've certainly eaten enough of it on camp-outs, but if I can, I prefer something like this white cheddar pasta that actually tastes great and doesn't leave you with a stomach ache. Not only is boxed pasta super light to carry (for you backpackers), it's heavenly to enjoy a hot meal out in the bush, especially if you have wet socks. Let's face it, you gotta roast something on a stick over an open fire when you are camping. This is what ground meat encased in a skin was born to do. My Ukrainian heritage always points me in the direction of the garlic smokies, although there are so many different type of great sausages to choose from. Directions: Skewer with a green stick. Roast over an open flame until the sides split and the juices run. Don't burn your mouth. I'm sure people other than us make these all the time, but I have never seen it. Maybe you're about to learn something new today! Anyway, if you're tired of S'mores, another great dessert is to simply take a banana, peel back a small section and scoop out a little flesh to make a valley in the banana. Fill the valley with Nutella and, if you wish, a few marshmallows (minis work best, but I didn't have), and place the peel back over the hole. Wrap in tin foil and place in the hot coals of a campfire. Cook about 10 minutes, poke to see if banana is soft, and if it is, remove from the heat. Eat with a spoon. Yum! Some people also replace the Nutella with chocolate chips and that's great too. Baking in foil is the best way to eat for camping: no clean up! Plus the food takes on an incredible smokey flavor from the fire that one can't duplicate at home. These potatoes are about the simplest side dish you can make, yet one of the best. Just scrub some new potatoes and cut them in half. Toss with a little olive oil and salt (I added fresh garlic and rosemary from my garden) and wrap up tight in foil. Toss the package onto the coals (never open flame) and forget about them for a half an hour or so. Tongs are useful to remove the packages from the fire when they are finished; just be careful of the hot steam when you open them! Similar to the potatoes, fresh fish needs no further dressing than to be rinsed, patted dry, seasoned with a few herbs and garlic and wrapped in foil. This fish cooked in about 10 minutes and needed to be turned a few times. It was moist and delicious, with all the juices contained in the foil. So what's your favorite camping food? Come on, let's have it!